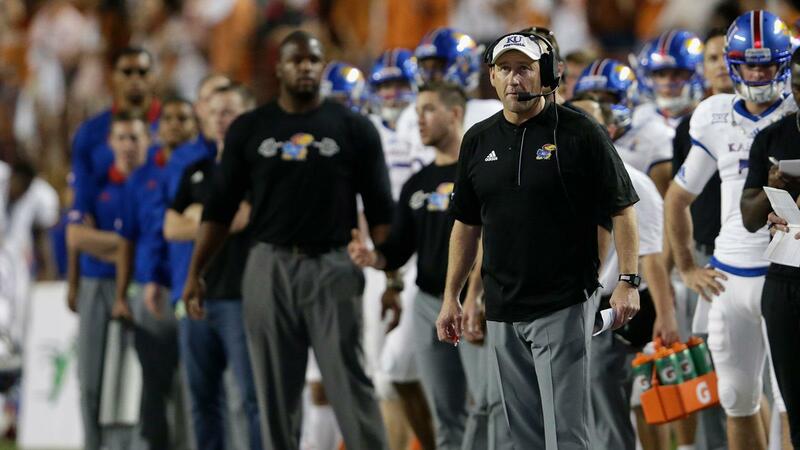 David Beaty has a dismal record of 3-33 as head coach for University of Kansas. As Americans are more divided than ever, it has become imperative that we need to find common ground. That’s why the list of the Worst 16 teams in college football could not come at a better time in our nation’s history. Because we hold these truths to be self evident—no amount of wealth distribution is going to prevent these programs from stinking up the Power 5 conferences this year. Every team has the right to bear their arms, no matter how erratic and interception prone they may be. And no matter how big a wall these teams build at the line of scrimmage, it likely will be ineffective in keeping invaders out of the end zone. So let’s shake hands, crack open a beer, lay down a little action on an out-of-whack point spread (Thanks, Supreme Court! ), and come together as a nation to watch millennials see how unfair life is that their universities are saddling them with student loan debt while they can’t even field a mediocre football team. Before Aaron Rodgers dated Danica Patrick and Olivia Munn and won a Super Bowl, he was leading the California football team to glory. Clearly, a lot has happened since then, including Cal’s decade of gridiron futility. Head coach Justin Wilcox got off to a great 3-0 start last season, but then injuries and a tougher schedule caught up with them as the team limped to a 5-7 finish. The Golden Bears have never quite found an heir to the Rodgers legacy. This season, Wilcox has a choice to make at quarterback. Junior starter Ross Bowers threw the ball well, but was as mobile as a hungover fraternity brother on your couch at 6 a.m. Athletic/erratic South Carolina transfer Brandon McIlwain may give Cal the elusiveness they are looking for behind an undependable offensive line. Cal will rely heavily on former walk-on Patrick Laird at running back. Laird rushed for 1,227 yards and caught 45 passes, but behind him, the backfield depth is as shallow as a fitness model’s Instagram page. The defense improved from 42.6 to 28.4 points per game last season, and 11 of the team’s top 14 tacklers are back. Unfortunately, talented defensive tackle James Looney and linebacker Devante Downs are not two of them. Cal may have had some hard luck losing three games by a combined 7 points last season, but like your wife with your credit card, luck has a way of disappearing when you need it most. Expect these Golden Bears to hibernate for another year. Remember when Peyton Manning was leading Tennessee to the SEC Championship? Neither do we. That was before the Xbox was invented. The Volunteers have some serious questions to answer in 2018, such as who is going to volunteer to be a decent quarterback? Stanford grad transfer Keller Chryst may not have made the smartest decision by spending his last year of eligibility at Tennessee. Sure, Chryst was an 11-2 starter at Stanford, but he had a 53 percent completion rate, and Christian McCaffrey is not walking through that door to take handoffs. J.T. Shrout will compete with sophomores Jarrett Guarantano and Will McBride for the lead role in offensive coordinator Tyson Helton’s pass-happy offense that was last in the SEC in scoring. “You have to throw that sucker down there and make everyone take a deep breath,” Helton has said. “Whether we catch it or not, you have to throw it down there.” Thankfully for Tennessee, their new wing and a prayer offense includes Jauan Jennings, a 6-foot-3, 220-pound receiver with an extraordinary vertical leap and who is coming back from a team suspension after blasting Tennessee’s previous coaching staff on social media with a profanity-laced tirade. Tennessee is going to need to throw quickly, as their offensive line is about as deep as an Adam Sandler movie. Last season, they were down to four healthy scholarship linemen, which is just about enough to get your quarterback killed. Head coach Jeremy Pruitt has definitely shown his skill as a defensive coach. But with the undersized lack of playmakers on Tennessee’s front seven, having this group of players stop the run in the SEC would be the greatest magic trick since the star of a mediocre reality TV show became president of the United States. With an unforgiving schedule that includes home games against West Virginia and Alabama, and road games against Georgia, South Carolina and Auburn, we don’t think any of Nashville’s greatest country music stars will be able to write a song this tragic in 2018. Last year marked the third time in Kentucky history that the football team has made three straight bowl appearances. In 1953, Bear Bryant led the Wildcats to their third straight bowl bid, and then he promptly left Kentucky, because he felt football would never be a priority over the school’s basketball team. Even George Orwell could not have predicted the future with such accuracy. While St. John of Lexington was leading the AAU/NBA transition program in Rupp Arena, the football team was finishing 96th in the nation in passing, and watching their starting quarterback Steven Johnson graduate. This means that no quarterback on the roster has played in an FBS game. JUCO-transfer Terry Wilson has been imported to compete for the job with inexperienced redshirt freshman Gunnar Hoak. With back to back 1,000-yard seasons, Benny Snell Jr. provides a lone bright spot for an offense that could use more efficiency. Leading receiver Garrett Johnson is gone, which leaves a receiving corps that is about as reliable as a loan repayment from Lenny Dykstra. Losing sure-footed kicker Austin MacGinnis, who had a knack for long-distance game winners, will also hurt a Wildcat squad that dropped from 58th to 87th in the nation in scoring with 23.3 points per game. Defensively the team returns nine starters, but will have to replace the hole left by middle linebacker Courtney Love. (That’s not a joke, but his actual name). The schedule is historically unkind to Kentucky when you consider they are currently on a 31-game losing streak to Florida, and have not won in Tennessee since 1984. But fear not, Kentucky fans, the 2018-2019 AAU victory tour will begin performances at Rupp Arena in just a few more weeks. Arizona State may have snuck into a bowl game last year, but Sun Devils fans know that for the last few years, the program has been sliding downhill faster than Lindsey Vonn. After watching ASU spend $12 million to buy out former head coach Todd Graham’s contract, only to bring in ESPN screamer Herm Edwards, Sun Devils fans hoped they were hallucinating from the desert heat. Edwards, who was an NFL head coach during the George W. Bush administration and a college football coach during the George H.W. Bush administration, brings high volume, but can he bring victories? Edwards famously told the press “You play to win the game,” when he was New York Jets head coach. But who is going to play to win games for these demons of mediocrity? Senior quarterback Manny Wilkins gets his fourth offensive coordinator in four years to hold the clipboard. Talented wide receivers N’Keal Harry and Kyle Williams are back. They’ll be busy as the team loses both of their veteran running backs, Demario Richard and Kalen Ballage. With an offensive line that gave up 41 sacks last year, the backfield remains hopeful that they can still stay under their parents’ health insurance until they graduate. Like eating Taco Bell after midnight, it goes from bad to worse on defense. Switching to a 3-3-5 alignment on defense is an attempt to straighten the tie on a cadaver and improve on the 177.5 yards rushing per game allowed last year. The Sun Devils were 109th in defense, giving up nearly 450 yards per game. A brutal schedule that includes Michigan State, Stanford and a road game at USC doesn’t help matters. Herm Edwards may win the award for entertaining press conferences at Arizona State, but don’t expect too many victories. When it comes to football, Tobacco Road has become a smoke-free zone as of late. Larry Fedora is an excellent coach, so this may be a brief appearance on the Worst 16, but the team will need to get their defense back to 2015 form when the squad was 11-3. Fedora will have to retool a defense that gave up five runs over 50 yards and five touchdown passes over 65 yards last season, and coughed up three fourth-quarter leads. Carolina has been last in the ACC against the run for five years straight. It doesn’t help matters that 13 players, including quarterback Chase Surratt, will be suspended up to four games this season for trying to “Be Like Mike” by selling their team-issued Nike Jordan sneakers. Sorry, guys, only coaches get to make money off of your shoe deal. Anthony Ratliff-Williams has been a lone bright spot at wide receiver and special teams, where he returned two kicks for touchdowns in 2017, but the offense won’t be enough to save North Carolina’s season. With four road games against teams that beat them at home last season (California, Duke, Miami, Virginia), the season will get late early in Chapel Hill. The Panthers left the 2017 season like a drunk leaving a liquor store with a Powerball ticket—they may have regretted some of their most-recent choices, but suddenly, there was hope. After erratic play at quarterback for most of the year, true freshman quarterback Kenny Pickett stepped in and led the team to an upset over undefeated No. 2 Miami. After having scored less than 24 points per game, their worse total since 2007, the Panthers are hoping Pickett can help them get back on the prowl. With three starting offensive linemen gone, Pickett will get plenty of opportunities to show off his speed. Defensively, former Northwestern linebackers coach Randy Bates takes over as coordinator. He’ll be tasked with revamping a defense that finished 106th nationally with 254.2 yards per game allowed and totaled only 23 sacks. Pittsburgh’s inconsistency has even plagued its special teams, as kicker Alex Kessman, who hit 55 and 56-yard field goals, made only 11 of his 19 attempts. With a difficult out of conference schedule that includes games at Notre Dame and Central Florida, and a home beating from Penn State, the sobering reality is that the odds of that Powerball ticket and Panthers success in 2018 are a bit longer than they may have thought. Things were looking a bit bright for Virginia last season, as the team perked up from two to six wins in year two of head coach Bronco Mendenhall’s reign. They even managed to sneak into a bowl game. But like an impressionist painting, the closer you look, the fuzzier it gets. The Cavaliers were quite cavalier at the end of last season, losing four straight games, including a 49-7 rout by Navy. The team only had 93.5 yards per game rushing—dead last in the ACC. Former Arizona State quarterback Bryce Perkins will take over the offense, but the offensive line is a huge question mark, as Mendenhall continues to shuffle players in different positions hoping for a winning combination. Slot receiver Olamide Zaccheaus will be challenging the opposing secondary and tongue-tied broadcasters as he steps up to become the team’s top pass catcher. On the other side of the ball, three of team’s top-five defensive linemen have departed from a squad that regularly allowed 200 yards per game rushing. Linebacker Micah Kiser who led the ACC past three seasons in tackles is also gone. “We only have 27 legitimate ACC-caliber players on our entire roster,” Coach Mendenhall said this past spring, trying to manage the expectations of those students that refer to their school as the ‘Harvard of the ACC.’ If they’re that smart, they won’t be fooled by last year’s bowl appearance and this year’s soft non-conference schedule. Even with LeBron James, these Cavaliers wouldn’t be very good. In a town full of stars, we could understand why UCLA was having an identity crisis after last season. After all, the Rams are building a brand new stadium and have a superstar quarterback in Jared Goff. The Lakers have become must-watch TV with LeBron James. And with star quarterback Josh Rosen leaving after his junior season for NFL fame and fortune, UCLA football seemed more like a short film than a feature. Maybe that’s why they broke the bank to bring in head coach Chip Kelly. The Bruins are hoping Kelly still has some magic dust left from his Oregon days after mediocre NFL stints in Philadelphia and San Francisco. He’s going to need it as the program, like many of the fading stars in Hollywood, is in need of a facelift to remain relevant. Kelly will likely look to freshman Dorian Thompson-Robinson to be the pass/run threat at quarterback that he needs to lead his up-tempo offense. Unfortunately, he’ll have to throw to a corps of receivers who have as much as experience as a Comic-Con attendee has with talking to women. Also to the Bruins detriment, 3.7 isn’t the team’s grade point average, but their yards per carry on a team with a constipated ground game. Kelly had to move defensive lineman Boss Tagaloa to the other side of the line of scrimmage to bolster an offensive line that is weaker than Amtrak’s Wi-Fi signal. Kelly is bringing in his right-hand man Jerry Azzinaro to shore up a defense that gave up six yards per carry, 287.4 rushing yards and 36.6 points per game last season. We wouldn’t be surprised if Kelly can eventually get an Academy Award-winning performance out of this UCLA program, but in 2018, their script will languish in turnaround. Head coach Tom Allen did a tremendous job with Indiana’s undermanned defense last year, but once the team hit the tough part of the conference schedule, they got sunburned from being on the field for too long. That solid defense is also losing eight starters this year, which means a very young group is going to have to battle the Big Ten behemoths. Allen hopes a steady quarterback will emerge from options that include redshirt sophomore Peyton Ramsey, graduate transfer Brandon Dawkins, freshman Nick Tronti, and Michael Penix, who chose IU over Florida State. Wide receivers Nick Westbrook and Donavan Hale are back after having their seasons cut short by injury. After having no 1,000-yard rusher for first time in four seasons, the Hoosiers should run the ball better with all five returning starters on the offensive line. A few easier games earlier in the schedule will give way to Big Ten powerhouses Ohio State, Penn State, Michigan. Like having drinks with Bill Cosby, things will start off well for Indiana before they get really bad, really quickly. After Maryland opened the 2017 season by putting 51 point on a good Texas team, things were looking bright for coach D.J. Durkin’s new-look Terrapins. But like M. Night Shyamalan’s films, the Terrapins got progressively worse throughout the season until they were completely unwatchable at the end. Maryland closed out the season by scoring 10 points or less in each of their final three games, including a 66-3 loss to Penn State that even made Jerry Sandusky wince. Durkin hopes the team has better luck with injuries this year as their top two quarterbacks, Tyrrell Pigrome and Kasim Hill, both return from ACL injuries. With only one receiver that has caught more than 13 passes in a season, the Terps are looking for steady hands in the receiving corps, and some freshman help is on the way. Unfortunately, as Marquette’s late great basketball coach Al McGuire once said, “The best thing about freshman is that they become sophomores.” Ty Johnson and Lorenzo Harrison will provide a solid 1-2 punch at running back, behind an offensive line that returns intact. But like Michael Cohen’s legal skills, it won’t be enough to cover up for Maryland’s shoddy defense, which was last in the Big Ten at 37.1 points per game. All Big Ten defensive end Jesse Aniebonam returns after missing last season due to injury. But will it be enough to replace the six starters gone? Probably not, because like reading War and Peace for the 10th time, the Big Ten schedule doesn’t get any easier, no matter how many times you slog your way through it. In 2016, it looked like head coach Mike MacIntrye had the Buffaloes roaming again in the Pac 12. But last season, wins became an endangered species as the team slid back to a 5-7 record. With a 61 percent completion rating and 18 touchdowns to 9 interceptions, Steven Montez is the J.K. Simmons of quarterbacks in the conference—really competent and above average in every performance, but not the marquee superstar you need to sell tickets. Who will Montez even throw to? All three starting receivers are gone, leaving Jay MacIntyre (the coach’s son) and Juwann Winfree coming off the bench to start. Four-year starting running back Phillip Lindsay has graduated, leaving the backfield emptier than a Russian oligarch’s money-laundered New York apartment. On the other side of the ball, the defense’s 28 points per game average doesn’t even tell the gruesome story. Opposing teams stampeded the Buffaloes on the ground with over five yards per carry and 451 yards of offense per game. MacIntrye is hoping to shore up the defense with JUCO transfers such as Mississippi-born linebacker Davion Taylor, who like Martha Stewart, decided to stay away from the SEC. You better roll ‘em if you got ‘em Colorado fans, because your team is going to get smoked all year. Playing in the SEC is like being first in line at Walmart on Black Friday. Once those doors open, one misstep and people will be running all over you. Last season, it looked like the Commodores finally had their sea legs with a 3-0 start. But after a 59-0 trouncing by the NFL’s 33rd franchise, Alabama, Vanderbilt would give up a record 346 points in conference play. Kyle Shurmur, son of New York Giants head coach Pat Shurmur, has finally given Vandy a steady arm at quarterback. Last year, Shurmur ended the team’s four-year streak of throwing more interceptions than touchdowns. But like a dad putting together an Ikea baby crib, will he have enough tools to get the job done? Vanderbilt’s all-time leading rusher Ralph Webb has relocated to the New England Patriots. Leading receivers C.J. Duncan and Trent Sherfield have also matriculated their way out of Vanderbilt. The good news is that Illinois transfer Ke’Shawn Vaughn gets to run behind a completely intact returning offensive line that only yielded 19 sacks last season. They’re going to need all the offense they can get to cover for a defense that racks up debt faster than Johnny Depp. San Francisco 49ers defensive assistant Jason Tarver has been imported to shore up the troubled defense, but even Picasso needed paint brushes. Without the talent on the roster, by mid-season you can expect these Commodores to run aground. After a few years of hard luck, it was beginning to look like Rutgers was beginning to make a comeback, as the defense started to show signs of life again under head coach Chris Ash, raising their win total from two to four games last year. But don’t get your hopes too high Scarlet Knights fans. Like Jimmy Hoffa, the offense is still missing. True freshman Artur Sitkowski looks like a made man at quarterback after senior Giovanni Rescigno completed less than 50 percent of his passes and threw for 517 yards total last season. That’s enough to get any quarterback whacked. And Sitkowski’s going to need some button-hook men to get the job done. The most experienced receivers, sophomores Mohamed Jabbie and Hunter Hayek, only caught ten passes combined last year. The team’s solid secondary will have to cover more than just receivers. They will have to cover for a mediocre front seven that allowed 4.6 yards per carry last season. With a murderer’s row schedule that include Northwestern, Ohio State, Michigan, Michigan State, Penn State, and Wisconsin, Rutgers may be looking for the safety of the WPP Conference (Witness Protection Program). The halcyon days of Illinois football, when coach Ron Zook was leading the team to victory over the likes of Ohio State, appear to be about as distant as a millennial at the dinner table. Illinois hasn’t had a winning record since 2011, exacerbated by the Lovie Smith error/era. The former Chicago Bears head coach has a combined 5-19 record over his first two seasons, with last season being even worse than 2016. After winning two non-conference games to start last season, the pacifist Illini surrendered their final 10 straight games, including zero wins in conference play. Two of the team’s three starting quarterbacks last season transferred out of this mess, leaving sophomore Cam Thomas as the default starter for now. Once promising wide receiver Mike Dudek returned from two horrible knee injuries to play last season, but didn’t look like the same impact player he once was. The Illini may depend heavily on running back Mike Epstein who ran for a team-high 346 yards in five games last season behind an offensive line that was about as stable as Kanye West’s Twitter timeline. Seven starters return on a defense that yielded 32 points per game last year and over 2,600 yards of rushing offense. With a schedule that includes South Florida, Penn State, Wisconsin, Nebraska and Northwestern, it’s enough to make Chief Illiniwek shed a tear. How bad did it get for Oregon State last year? If it wasn’t for a three-point squeaker of a victory against tiny punching bag Portland State, the Beavers wouldn’t have sniffed a win last year. More shocking than Jimmy Garoppolo’s dating choices, head coach Gary Andersen left $12 million of guaranteed money on the table to quit right in the middle of the season, leaving the team completely rudderless. Enter new head coach and OSU legend Jonathan Smith, who was once a walk-on quarterback that led Oregon State to a Fiesta Bowl victory in 2001, when Ocho Cinco was simply known as Chad Johnson. Senior quarterback Jake Luton can only carry the team so far, as a broken back nearly forced him to retire from football last year. OSU might keep swiping left until they find a soul mate at running back. They’ve already had to convert defensive back Christian Wallace to running back this spring for some minimal depth in the backfield. Despite the lack of talent, the offense looks like the 2007 New England Patriots compared to a that defense gave up 43 points per game last season, including losses to several teams on our Worst-16 list. Pick your poison, as the team gave up 2,829 yards rushing and 2,848 yards passing last season. Coach Smith told the press before the season that he was “at my dream job, in my dream town, at my dream school.” But even Paul Bunyan wouldn’t be able to rescue this team’s chances from the Oregon wilderness. Ever since Mark Mangino was forced out as head coach in 2009, hard times have befallen Kansas football. Since Mangino’s departure with a 50-47 record and the school’s only BCS bowl win, the Jayhawks have an incredible 15-81 record. In fact, they’ve yet to win more than three games in a season since they replaced Mangino. Though It’s hard to imagine a team being worse than Kansas was in a 2-10 season in 2016, the 2017 version of the Jayhawks continued to defy even the worst expectations. After extending head coach David Beaty’s contract in 2016, he rewarded the university by giving them, you guessed it, a 1-11 season! This brings his record to a truly amazing 3-33 overall. Who will lead the team at quarterback this season? Good question. Much like the entire 2017 season, as of the spring, Beaty still hadn’t decided between senior Peyton Bender and junior Carter Stanley. Whoever draws the short straw will be running for their lives behind an offensive line that didn’t even have enough healthy linemen for a spring game. This level of consistency has been a hallmark under the Beaty era, where only two of his original assistants remain from when he began his tenure. The defense gave up over 3,500 yards passing last season and 43 points per game, making Kansas as easy to score on as a Jenner at the NBA combine. The lone bright spot on defense was senior linebacker Joe Dineen who deserves the medal of honor for tallying 137 tackles, including 25 behind the line of scrimmage for a dreadful team.